Growing your Garden Plants from bulbs. Bulbs and corms for planters. 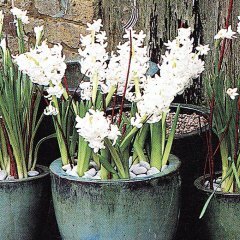 When planting out bulbs a good rule of thumb is that they should be planted to a depth of two to three times their height. So larger bulbs will be planted deeper than the smaller ones. This means you can plant them in layers with the smaller bulbs over the top of the large. Each layer separated by soil. When selecting your bulbs consider their size and colour. In general smaller bulbs will flower early in the spring with smaller blooms while the larger bulbs will flower later. When you buy your bulbs ensure that they free of mould, clean and have a firm feel to them. For colour in the spring: There is nothing that quite matches the impact of flowering bulbs. Different species and cultivars can be planted in the autumn, or grown in planters to be replaced continuously, giving a succession of displays from February to May. 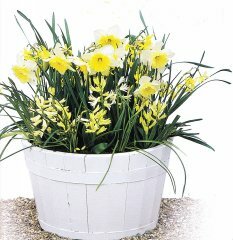 In smaller planters and window boxes it is easier to insert bulbs planted in pots. Because of the limited space in such planters, it is also useful to plant layers of different kinds of bulbs, both to blend in with the other planting and also to have a succession of flowers. For example, tulips can be planted just below the surface, with daffodils somewhat deeper. Buying bulbs: When purchasing bulbs, always go to a reputable source, even if this means paying slightly more for good quality. Bulbs should be firm to the touch. Planting spring-flowering bulbs: Spring-flowering bulbs are planted in the autumn, as soon as possible after they have been purchased. Preparation: Soil preparation is not too critical for the range of bulbs that are likely to be the most useful in planter gardening. It is always better, however, to use "new compost", which must be free-draining, rather than compost that has already been used for growing summer bedding plants. lf it is essential to use the same compost, just remove the plants, break, up the soil with a small hand fork, and top up with new compost. 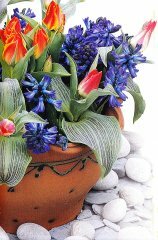 If the soil has become very dry, water thoroughly before the bulbs are planted. Then allow the planter or winndow box to drain. Planting: Set the bulbs firmly in the planters at the depths indicated in the list below. Fill in with compost or bulb fibre. Then stand the planters in a cold green-house or frame, or out of doors in a sheltered spot, and keep the compost moist. Crocus. 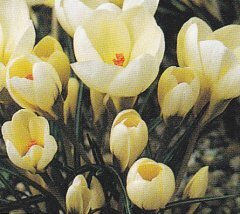 The spring-flowering crocuses associate well in planters with-large permanent plants and look particularly well with conifers; they are useful as carpeting plants or fillers. The Dutch crocuses are probably the best for planters as they have large, bold flowers growing up to 10-13cm in height. Cultivars, 'Jeanne d 'Arc', snow white; 'Remembrance, violet-purple; 'Vanguard', pale lilac; 'yellow Mammoth', golden yellow. The free-flowering cultivars of Crocus chrysanthus and C. biflorus are also excellent plants for planters with smaller but more numerous flowers than the Dutch crocus. Cultivars: 'E.A. Bowles', deep yellow; Snow Bunting', white; 'Blue Pearl'; 'Lady Killer, purple and white; 'Cream Beauty'.Crocus sieberi, quite vigorous. has several forms, usually pale mauve; but a good white one is 'Bowles White'. Flowers in February. Plant with the "nose" of the corm just below the surface, with the corms 5cm apart. Mice and voles are rather fond of crocus corms, so cover the compost with small-meshed chicken netting. Fritillaria imperalis (crown imperial ) A dramatic plant that flowers in April-May and is suitable for large planters as it grows up to 1,2m high. There are red and yellow forms, and one with orange flowers and white-variegated foliage, plant 15cm deep and 23cm apart. Galanthus (snowdrop). 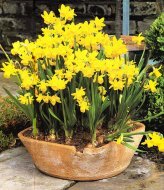 This most popular of all the spring-flowering bulbs can be planted directly in a planter, or pre-plant in pots and then inserted when flowering. 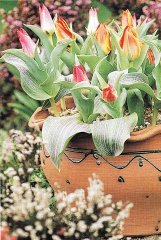 Ideally , they should be planted just before the leaves die down; so long as good quality, plump, dry bulbs are selected they should flower well if planted in the autumn. There are many cultivars available, including ones with double flowers, but for general purposes ordinary Galanthus nivalis is as good as any. Plant snowdrops 5-10cm deep and about 2.5cm apart. Hyacinthus (hyacinth): Rather formal when in flower, hyacinths make an early splash of colour and are most effective when planted in groups. Their heavy perfume makes them particularly attractive when planted near the house. Cultivars: 'Deft Blue' porcelain blue; Ostara, deep blue; 'L'Innocence' white, 'Jan Bos', deep red, 'Lady Derby' rose pink; 'Pink Pearl', deep rose pink; 'Gypsy Queen' salmon-orange; 'Yellow Hammer', yellow. All grow to about 23cm high. Plant 10cm deep and 13cm apart. Iris: There are many different kinds of iris' and several of the bulbous species and cultivars are excellent for window boxes or planters . The dainty Iris reticulata flowers in February and March and has purple scented with golden markings. 'Cantab' is pale blue with orange markings. 'Harmony' is sky blue with yellow markings. 'J. S Dijt' is reddish-purple, 10-12,5cm high. Plant about 7,5cm deep and 10cm apart. All Dutch irises are good, as are I. danfordiae (yellow) and I. histrioides (light or deep blue). Muscari(grape hyacinth): These associate well with other bulbs especially daffodils and tulips and in full sun or partial shade their bright blue flowers can be very effective. M. armeniacum is very frequently grown, with each bulb sending up several flower spikes 15-20cm: 'Blue Spike', deep blue with white edge. Plant 7,5cm deep and 5cm apart. February Gold 25cm clear yellow, long-lasting. February Silver; as February Gold but with white petals; 'Peeping Tom',35cm deep yellow, long lasting; 'Tete a Tete' 15cm lemon yellow, two or more flowers on a stem, very early-flowering. 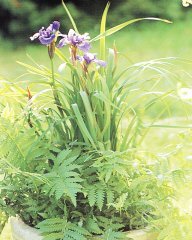 Plant the smaller bulbs listed above 5-7,5cm deep, the larger ones 10cm deep 5-10cm apart. Single early: These begin flowering in April on short, sturdy stems about 25cm high. Double Early: Fully double flowers, particularly suitable for window boxes and planters 25cm. Triumph: Flowering mid-April on taller, strong stems up to 45cm high. Darwin hybrids: Late April to early May, with large rounded flowers on stems 60cm high. Single late: May-flowering, similar to Darwin hybrids 60cm. Double late: These flower in may and will give a long display in a sheltered position. Similar to the above, but with fully double flowers 60cm. Lily-flowered: Graceful flowers with pointed petals and can grow to 60cm or higher and May flowering. Kaufmanniana hybrids: Dwarf and early flowering. Can be left in situ to flower year after year and grows to 30cm in height. Greigii hybrids. Dwarf and April-flowering with strikingly mottled and striped foliage which is attractive in itself.